'Enslaved Land' is a one year data driven and cross-border investigation developed by eldiario.es newsroom in collaboration with El Faro. This project reveals the hidden sides of the economy in developing countries that is based in agro industry and plantations. The project involved nearly 20 journalists that uncovered the hidden abuses behind five different crops consumed widely in Europe -palm oil, sugar, coffee, cocoa, and banana- in four countries: Guatemala, Colombia, Honduras and Ivory Coast. We would recommend everyone to take a look at the online project and its beautiful infographics. 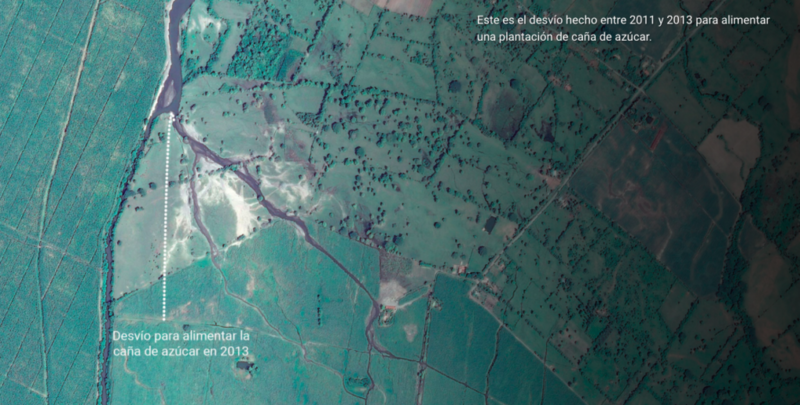 Below you can read the uncovering investigation on how the sugar industry in Guatemala has created a cartel linked to offshore companies to avoid taxes. On July 18th 2012, a lawyer in Panama and an assistant in Guatemala City arranged the creation of three opaque entities for one of the sugar emporiums of the country. That week, Mossack Fonseca registered each company in a different tax haven. Roydon Trading Company, in Panama; Wellon Sugar Commercial, in the British Virgin Islands; American Trade Incorporated, in Bahamas. The business of Wellon Sugar Commercial “is the sugar trade,” wrote another executive of the company in a different email. As it would happen with the 214,000 entities created in tax havens with the help of Mossack Fonseca, internationally investigated for its operations, the companies related to the Campollo Group would be managed by figureheads, of Panamanian nationality. They would represent the interests of the Campollo siblings: María Eugenia, Ramón, Ricardo and Rosa María. Between 2007 and 20015, the Campollo Group, owner of El Ingenio Madre Tierra, created 121 offshore companies with an authorized capital of 282 millions of dollars in total. 47 entities were related to the sugar trade, with a capital that adds up to 113 millions. Madre Tierra is behind the 7,2 percent of the total production of milled sugar cane in Guatemala since 1983. It is the seventh biggest producer, of the twelve there are in Guatemala. The creation of offshore companies in tax havens is legal, even though the authorities suspect that the practice is intended to evade the tax authority of the countries where the entrepreneurial activity of the company owners is concentrated. In the case of sugar, the fact that the business gets out of Guatemala’s borders contradicts the idea of national well-being, which the industry attempts to project with its logo and slogan. “Development for everyone,” say the sugar refineries, who don’t have problems in using offshore companies. Besides the Campollos’ offshore entities, this investigation found links between nine other Guatemalan refineries and entities in tax havens. The managers, owners and companies who participate as the refineries’ shareholders, appear as executives in offshore companies. This activity has drawn the attention of the authorities, but they claim to be incapable of overseeing it for being outside Guatemala’s borders. The sugar refineries are a powerful group, traditionally related with the political establishment, in a country with enormous difficulties to collect the taxes of its 2,100 major taxpayers. Guatemala is the country with the lowest tax revenue in Latin America. The authorities recognize, that to guarantee that the “special taxpayers” like the sugar industry pay what they should is, for the moment, impossible. In Guatemala, there are experts, former directors of the Tax Administration Superintendence (SAT), businessmen, refineries’ employees and international organizations like the Economic Commission for Latin America and the Caribbean (Cepal), part of the ONU, who argue that the sugar industry is clearly a cartel that takes advantage of state weakness, a “collusive oligopoly,” since many companies behave as one to maintain an advantageous position in the market. Since 1983, seven families have been behind the 88 percent of the milled sugar cane in Guatemala: the Herrera (refineries Pantaleón and Concepción), the Leal (Magdalena), the Botrán (Santa Ana), the García (La Union), the Weissenberg Campollo (El Pilar), the Campollo (Madre Tierra), and the González Bauer-Hertzsch family (Palo Gordo). All of these families have been related with entities in Panama. The fact that ten of the twelve Guatemalan refineries are directly related with offshore companies fits perfectly with the profile of an industry that has also financed the campaigns of Presidents and deputies, that has placed functionaries in key government positions, blocked laws like the regulation of water use, or promoted other ones, like one to reduce tax payment on exported sugar and other agricultural products. And in all cases, the Government responds declaring itself incapable of overseeing the industry as it should. During two months, we tried to arrange interviews with the twelve sugar companies so they could elaborate on their relations with the political establishment, on their labor and environmental conflicts, and on how their managers make use of the companies in tax havens. Except for Madre Tierra, the rest of the refineries remained silent. Madre Tierra’s response was unequivocal. “We don’t have any interest in going through such an interview, given that the character of the company is PRIVATE, and, as such, its trade and business operations are under its own CONFIDENTIALITY AND JURISDICTION,” wrote the company’s lawyer, Marvin Sandoval, in an email. Guatemala is the fourth biggest sugar exporter in the world, after Brazil, Thailand, and India. Without fixed markets, its exports end up with the highest bidder. In 2014, South Korea, the United States, and Tunisia were the principal importer countries. In Guatemala’s southern coast, bordering with the Pacific Ocean, there are 268,000 hectares of sugar cane fields, according to the agricultural census in 2014. Twelve refineries process all the cane of the country and turn it to sugar, molasses, ethanol, rum, or even electricity. The refinery Madre Tierra, property of the Campollo family, spreads over 17,000 hectares, the equivalent of some 42,000 soccer fields. Madre Tierra began growing sugar cane in 1963, and, since the 1982-1983 harvest, it has milled 35 million tons of cane, according to the Guatemalan Center of Sugar Investigation and Training (Cengicaña). The Campollo family also have refineries in Costa Rica and in the Dominican Republic, and investments in oil, African palm, ethanol, electricity generation, and real estate. MT Holdings Capital INC., an entity in British Virgin Islands, exercises the ownership over the refinery through a network of companies, which can be better explained as resembling a matryoshka, the Russian doll that keeps another doll in its interior, which in turn keeps another doll in its interior, and so on. Madre Tierra is owned by Central Agro Industrial Guatemalteca S.A. (Caigsa). This one, in turn, is owned by two Panamanian companies: Gran Flora Internacional S.A. and Perlino Internacional S.A. And both of them are owned by MT Holding Capital INC. The Campollo siblings are shareholders in this holding company, according to Mossack Fonseca’s emails. One document shows that on February 13th 2009, the holding company handed 12,500 shares to each of the siblings, “Moncho”, “Richard”, “Rosita” and “Magena”, as they are called, according to the emails, by the family’s lawyer, José Buitrón. “Magena” is María Eugenia Campollo, the businesswoman whose assistant communicated with Mossack Fonseca’s lawyer to agree on the creation of the three offshore companies. MT Holdings Capital INC is the Campollo family’s second biggest offshore company. It has an authorized capital of 55 million dollars, according to the Panama Papers, a series of documents from the Panamanian law firm Mossack Fonseca, leaked to the German newspaper Süddeutsche Zeitung, and analyzed by more than a hundred media outlets around the world, including El Faro, as part of a year-long investigation coordinated by the International Consortium of Investigative Journalism (ICIJ). The entities in Panama, a tax haven, don’t have an owner and can be the owners of any asset, concealing its final beneficiaries in a great measure. For instance, the regulation of the Fundación Niño Jesus, an entity created in 2008, has María Eugenia Campollo as the beneficiary of all its assets, and her offspring as substitutes. Another use that the Campollo family makes of its offshore companies is the loan underwriting. Gala Assets Corporation, a Panamanian entity owned by the Campollo family and dedicated to power generation and sugar trade, was transacting a loan worth 75 million dollars with the Guatemalan banc GyT Continental at the beginning of 2015. An email, from February 5th 2015, shows that Central Agro Industrial Guatemalteca, the company owned by the refinery Madre Tierra, and its offshore owners would provide the 73 percent of the loan with their own capital. Just like the Campollo and its network of 121 entities in tax havens, the representatives or managers of other nine Guatemalan refineries appear in association with 31 companies registered in Panama, as shown by eldiario.es and El Faro. Of all the sugar refineries in Guatemala, the only ones of which this investigation hasn’t found any links with tax havens are the small refineries La Sonrisa and Santa Teresa, which since 1983 have only contributed to the 0,5 percent of the cane milling, some 2,2 million tons. The owners of Pantaleón are related to eight companies in Panama and the group’s head office is registered in the British Virgin Islands, as shown in a document of the ‘Comisión para la Defense de la Competencia’, in Honduras. Pantaleón has been the biggest cane miller in Guatemala for the last three decades: 91,3 million tons, the 26 percent of the total cane milling. Between 2008 and 2010, the refinery received two loans worth 130 million dollars from the International Finance Corporation (IFC), the World Bank’s private lending sector arm, through its head office in the Virgin Islands, Pantaleon Sugar Holdings Company Limited. In other words, the World Bank granted a loan to an entity in a tax haven. Some of these offshore companies are used to manage the refineries in Guatemala. For instance, the Trinidad refinery, which merged with the San Diego company in 2010, is leased by the entity Servicios Agropecuarios San Diego, whose owner, by 50 percent, is another one in Panama, called Santa Lucia International Group INC. No decisions, like the suscription of loans, contracts, or the authorization to compete for tenders, can be executed without the offshore company’s approval. Of all the investigated refineries, only details could be gathered about the entities created by the Campollo family, who was affected by the leaked emails of Mossack Fonseca. The other families created their offshore entities with different law firms. If one would put together all the cane fields of Guatemala, that great mass of land would be three times the size of New York City. It is a green monster of some 2,687 square kilometers, the 10 percent of Guatemala’s cultivated area, which is also the cause of social injustice and labor violations. The sugar farming in Guatemala is sparsely industrialized. The cane plants, which can reach a hight of five meters and consume high amounts of water, grow in the farms for approximately six months. The harvest begins with the burning of the fields to weaken the stem of the cane, which makes the cutting easier and keeps animals away. After the burning, thousands of workers enter the fields and cut the plants with machetes, getting in constant contact with the soot produced by the fire. They carry the cane to the collection point during long working days, sometimes without access to water sources or health services. The cane is then transported to the refineries in “cages” on board of large trucks. It is in the refineries where the plant is processed, and the sugar and its derivates are produced. Two government offices of the United States describe Guatemala as a “low-cost” sugar producer, which is explained by the “failure” of the refineries to comply with the labor laws, according to the commercial treaties agency of the White House. Throughout the industry, the labor unions have disappeared, except for one in the Palo Gordo refinery, the eighth largest producer of milled cane, according to data collected in 2016. Environmental denunciations have also appeared. Between 2012 and 2016, the Environment Ministry received 38 denunciations against nine refineries, the majority of them linked to the deviation of rivers to irrigate the fields. The environmental outrage is proportionate to the economic revenues generated by the sugar production, thinks Yuri Melini, the director of the ‘Centro de Acción Legal, Ambiental y Social’ (Calas). “Who wouldn’t be competitive, when the state is giving them indirect subsidies as it doesn’t charge for the water they use? Who wouldn’t have that profitability, when they haven’t allowed us to have a general water law?”, asks Melini, a former Presidential candidate for a left-wing movement. The Madre Vieja river, one of the biggest ones in Guatemala’s southern coast, is frequently deviated to water the cane plantations. This was the river, at its mouth, in 2011. This is the deviation made between 2011 and 2013 to water a sugar cane plantation. The Guatemalan sugar industry represents the 3 percent of the total economy, around 1,900 million dollars per year, according to the sugar producers, which, for a developing country, is not to be overlooked. Guatemala’s sugar economy is of the same size as Belize’s total GDP, its neighbor. There are twenty-five countries with smaller economies than the worth of the profit produced by Guatemala’s sugar industry. The groups responsible for this thriving economy are the twelve active refineries that are spread over four provinces along the southern coast. They co-govern with an influence comparable to the one of some five dozen municipalities. Sometimes, they even substitute the local authority, for instance in health concerns, where its hospitals care for more than fifty thousand consultations per year, or in education, where its schools prepare more than ten thousand math teachers. The monster’s movements are sometimes heavy and clumsy, and they end up provoking disasters. When this occurs, the communities stand up for their rights, try to confront them, but they never end up winning the fight. There have been many outbreaks of social unrest in Guatemala’s southern coast over the last years, among other things, because of water use, pollution, and damage to property. In January 2014, a community of Mam ethnicity, in Nueva Cajolá, Champerico, threatened to burn the cane trucks that drove through and deteriorated their communal street. The trucks belonged to the Magdalena refinery, which has produced one quarter of the Guatemalan sugar over the past decade. The patience of the community was exhausted when the refinery took down street posts and a fence, in order to shorten the way. The Mam’s attempt to revolt and protest was resolved not through dialogue, but through power. In Guatemala, nothing can stop the industry, which has built two hundred fifty-thousand kilometers of inner roads within its territory to avoid communities like the one in Nueva Cajolá. Between 2011 and 2016, the sugar refineries paid some 708 million dollars in taxes for the production of sugar and other related products like molasses. But the State cannot tell if that is the real quantity that the industry should be paying. “I wouldn’t like to generalize, saying that all of them are defrauding us, because it isn’t true. But I also can’t say that all of them are the best exporters, because it isn’t true either,” he adds. A data-base of judicial processes, created for this investigation, shows that eight refineries are involved in 78 tax processes. The one with the most processes is the Pantaleón refinery, with 25 cases, followed by the Magdalena refinery, with 15. The access to the content of the cases is confidential in Guatemala. Solórzano Foppa’s predecessors as heads of the SAT and an engineer who knows about the work of the refineries assure that the sugar industry makes use of offshore companies to reduce the tax payments through legal procedures. The refineries often use the offshore companies as intermediaries for the end customer of the batch of sugar they are selling. This provides the opportunity to reduce the tax payment on the taxable sales. This is because the invoice that the state takes into account could show a smaller amount or sum than the one that was actually arranged with the end customer for the purchase of sugar. The former tax superintendent, Abelardo Medina, points out the possibility of circumvention: “It isn’t a secret: subsidiary companies, head offices, and branches are being used to disguise the companies’ businesses abroad and avoid the tax payments. It’s simple,” he says. The Vice-minister of International Trade, Eduardo Lacs, was asked if the office of the Ministry of Economy, which is constantly mentioned in the offices of Expogranel, has a way of controlling that the refineries’ businesses are not being concealed from the State. Expogranel is a company created by the refineries in the nineties to transact the exportations and manage the warehouses in Puerto Quetzal, the only port in Guatemala for the sugar exportation. “The control of transfer prices or other controls with tax purposes is not our responsibility. This is entrusted to the corresponding institutions, among them the SAT,” he answered. This newspaper also tried to contact Expogranel, for two months, to arrange an interview with the manager Marcos Chang, but there was never an answer. Depending on whom is being asked, the Guatemalan sugar industry can be either a cartel or an oligopoly, or only an industry with a very efficient and profitable business scheme. Among those who claim that the sugar industry in Guatemala is a cartel, are the Economic Commission for Latin America (Cepal), two former heads of the SAT, a director of the Economic Development Foundation (Fundesa), and various researchers and organizations like the Institute for Agricultural and Rural Studies, and the Coordination for NGOs and Collectives (Congcoop). For them, the industry is defined by several companies that behave as a single one, and that arrange prices and other aspects of the business, taking advantage of a position of power in the market. This has been clear for the Cepal since 2006. The institution came to he conclusion that the sugar industry is an almost perfect machinery in which the different parts of the production chain reach an agreement on every step, from the cultivation to the distribution. It is a machinery in which “the refineries function as a cartel of distribution within which there is no price competition,” according to a report by the Cepal. In Guatemala, although there are twelve refineries, there are not twelve different sugar brands competing in the market. All the refineries send their milled grain to a single company, Maquinas Exactas S.A., for its packing and fortification with vitamins, and it is here where the packages of the twelve different brands are distributed to the market. “We are partners for the consumer’s well-being. The labelling, the exact weight, all these are policies carried out by the ministry, required by the ministry,” justified the vice-president of the Guatemalan Refineries Association (Asazgua), Armando Boesche. When the refineries’ spokespersons are asked for questions, they respond that only Asazgua can speak on their behalf, which also decides how much sugar must be produced by each refinery; in other words, that controls the offer and the prices in the domestic market. Boesche explains it as follows: “The only control, by constitutional reason, is the exportation, because the Ministry of Economy and me, as Asazgua’s legal representative, must verify that the supply of the national market is being fulfilled with each export,” he says, trying to tinge the power they have over the market. Of the 2,7 million tons of sugar produced in Guatemala between 2015 and 2016, the 27 percent stays in the domestic market, according to data from Cengicaña. Another characteristic of the cartel is that the domestic price is highly profitable in respect to its costs. According to Cepal, the Guatemalan refineries compensate with the domestic sales what they lose when the export price is low. Asazgua defends itself saying that, in Central America, Guatemala is one of the countries where the sugar is sold the cheapest. Experts like Abelardo Medina, argue that to maintain the boom in the domestic market, the refineries protect the entry of sugar from other countries with non-tariff measures and the obligation that all the sugar to enter Guatemala must be fortified with vitamin A. “With this measures, there is no other producer that can get its sugar into the local market,” says Medina. But the true gold mine, as all of those consulted for this article claimed, lies in the exportation. Around 70 percent of what is produced in Guatemala is sent to other countries. In 2015, the sugar exports to the international market added up to 851 million dollars, according to the Ministry of Economy. This is approximately the 9 percent of the Guatemalan Government’s current budget. The sugar cartel even controls the exportation, deciding who can and who can’t participate in it. The main requirement is being shareholder in Expogranel, the refineries’ company that manages the sugar exportation. Those who don’t invest in Expogranel can’t export in the country, the fourth biggest exporter in the world. “(It) is a full-fledged cartel, with free hand in a country where the legislation of competition regulation has been ‘frozen’ in Congress for more than eight years,” concluded a report from the Institute for Agricultural and Rural Studies, IDEAR, in 2008. Nine years later, the competition law hasn’t been implemented, and, even then, high officials in the Government still resist calling the sugar cartel by its name. “We don’t have any legal or economic elements that could indicate that this industry is a collusive oligopoly. In our country, there are fifteen producers and all of them compete on equal terms in the international market,” answered the Vice-minister of International Trade, Eduardo Lacs, per email. In his answer, Lacs included two refineries that have been merged with others, and a third one that is not yet operational. The landowner and cane grower, José María Rodríguez Briz, was killed twenty-five years ago, on March 23h 1992, from a shot in the head “during an ambush” in his farm, as the local newspaper Prensa Libre wrote in a title. Born in Cantabria, Spain, he confronted, during the last months of his live, the rejection from the Guatemalan refineries to his idea of starting a new sugar refinery in the country, as he had told his relatives. Rodríguez Briz provided cane to the refineries in the southern coast, and, at one moment, they decided to stop buying it from him, as he could become a serious and difficult competition. He had owned a large expanse of land in Escuintla, the province with the largest sugar cane fields in Guatemala. He had found other obstacles with the banks: “José María also found serious difficulties (…) within the Guatemalan financing system, closely linked to the sugar industry, when it came to receive funding for his new business,” said the former honorary consul of Guatemala in Santander, Spain, Enrique Sánchez, a close friend of the Rodríguez Briz’s family. Rodríguez Briz’s heirs, who declined giving an interview, moved to Belize, where they found the support they needed and created the Santander Sugar Group. “The family knew about the difficulties to develop a refinery in Guatemala,” explains Sánchez, who accompanied the family in the port of Santander, for the unloading of six thousand tons of sugar from Belize, in August 2016. “The sugar industry in Guatemala is, almost entirely, in the hands of a few powerful and affluent families, influential in the country, who aren’t pleased by the idea of having to share this business with new refineries,” says Sánchez. The sugar industry is a very closed circle that doesn’t tolerate, and that doesn’t want to expand with, new refineries, and those were the problems that José María encountered,” he added. The crime was never resolved, and, even today, it is being speculated about the causes of his death. The former consul, Sánchez, refused to blame anybody, which, he says, would be irresponsible, but he pointed out that the rejection from the refineries to a new company was the context in which the assassination of Rodríguez Briz happened. “He gave up… well, he didn’t give up to his illusion of starting a refinery in Guatemala, he wasn’t allowed to finish because he was killed,” he said. The blocks against the competence have been repeated over time. In 2005, big sugar shipments from Cuba, arranged by the then President of Guatemala, Alfonso Portillo (2000-2004), were suspended when the refineries ordered to do so. The Vice-president of Asazgua, Armando Boesche, has a deep knowledge over this episode, since he was one of the persons who helped stopping the importation of sugar. The sugar refineries opposed that importation because they hadn’t participated in the negotiation of the treaty arranged by the President Portillo, and because they complained that the Cuban sugar wasn’t fortified with vitamin A, as it was ordered by a law dating from 1992. This law also ordered iodine to be added to salt, to reduce illnesses such as children’s blindness and goiter. The Cuban sugar was being sold for a cheaper price than those controlled by Asazgua, and Cuba didn’t pay duties, while the sugar that Guatemala sent to the island did. “We only asked, as always, for equal terms, that’s all,” says Boesche. A Guatemalan businessman who took part in the sugar importation from Cuba maintains that the last importations took place during Berger’s Presidential term. “When Berger won the elections in November 2003, I remember that, on the same night, Asazgua raised the price of the 50 kilogram sack by twenty Quetzals (around 2.50 dollars). That was a way of telling us that their candidate had won, and that we had to get out of the market, we couldn’t bring one boat, risking that we wouldn’t be able to unload,” he said. The businessman maintains that, far from any corruption plot (Portillo was later condemned in the United States for a misappropriation of funds donated to Guatemala by Taiwan), the former President’s idea was to counter the sugar cartel and to benefit the end customer. “We knew we were meddling with one of the most powerful groups of the country,” he said. Portillo had refused to arrange meetings with the refineries and had permitted the Cuban sugar to be fortified with vitamin A after arriving to Guatemala. But months after Berger took over the Presidency, his Minister of Health closed the fortification plant. “It was a political decision, nothing but that, there was no justification, the political will to import sugar from Cuba disappeared with Berger,” complained the businessman. Asazgua admits that it blocked the importation of sugar from Cuba, but maintains that it did it for reasons of public health. “What we were asking for is that, if there was sugar coming in, than it should be fortified, packed, and processed,” said María Silvia Pineda, of Fundazúcar, the social branch of the Asociación de Azucareros, which promotes policies of business responsibility. “If sugar is entering the country, then it shouldn’t damage the people’s health,” adds Boesche, the vice-president of Asazgua. The 3 percent of Guatemala’s territory is occupied by sugar cane fields. In certain provinces in the south coast, the landscape has been transformed because of the expansion of the cane. Suchitepéquez, for instance, has changed 40 percent of its arable land to grow cane, according to a study by the sociologist Katja Winkler. When Guatemala finalized thirty-six years of internal war with the 1996 Peace Agreements, the struggle for land distribution began. With the constant expansion of monoculture plantations like sugar cane, African palm, banana tree, watermelon and rubber, the competition for the land grew. In 2002, 1.5 percent of the farms were the owners of 62,5 percent of the arable land, according to the agricultural census of the same year. In 2008, more than 1,500 land conflicts had been registered by the Procuradoría de Derechos Humanos; and today, a weak Guatemalan Land Fund, without enough money to buy land at a fair price and distribute it, hasn’t been able to change the situation. When peasants without land-ownership have been willing to take over territory of the refineries to settle themselves, as it occurred in 2010 in the Polochic valley, some three hours north of Guatemala City, the answer of the refineries has been to call the State, its most powerful ally. On March 14th and 19th 2011, 750 families were taken out of their homes by soldiers, police officers and private security guards in the Polochic valley. Some huts were burned, as were the crops for domestic use, and the peasant Antonio Beb Ac was killed without a judicial order. Behind the eviction was the family Widmann, which is related to the former President Berger. The Widmann family wanted to move their Guadalupe refinery from the southern to the northern coast, and the peasants and farmers who had settled there were preventing it. That episode was sanctioned by the Inter-American Commission on Human Rights for not carrying out the protocol for eviction of settlements, but, to this date, the Guatemalan Government has not responded to the victims, nor has it managed to relocate them and secure them with access to land. The community is of Q’eqchí’ ethnicity, almost none of them speaks Spanish, but through a translator they explain that they are still waiting for the help from the Land Fund. Until today, only 150 families, from the 750 that were affected, have received a house from the State, and their basic needs are not being taken care of. This is why the community does not intend to abandon the place, six years after the eviction. Despite the hunger, the cold, the lack of food, and the poverty. “We will stay here because Antonio (Beb Ac) died here; here he shed his blood, so this land has already been paid by him,” said José Caal, one of the leaders of the community. The Q’eqchí’ community will stay on that land until the lawful owners will permit, or until the Government relocates them once and for all. This land still is, and will still be, owned by the Widmann’s, by the SER Chabil Utzaj refinery, and by a cartel of more than 1,900 million dollars that doesn’t let go.